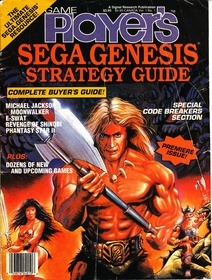 Game Players Sega Guide!, originally known as Game Player's Sega Genesis Strategy Guide was a US-based magazine published between Autumn 1990 and April 1993. It covered Sega consoles (specifically the Sega Mega Drive, Sega Game Gear and Sega Mega-CD, while its sister magazine Game Players Nintendo Guide covered Nintendo. The two magazines were eventually merged into Game Players. As the name suggests, Game Players Sega Guide! offered little more than walkthroughs and guides for Sega games. #0101: "Vol. 1, No. 1"
#0201: "Vol. 2, No. 1"
#0202: "Vol. 2, No. 2"
#0203: "Vol. 2, No. 3"
#0204: "Vol. 2, No. 4"
#0205: "Vol. 2, No. 5"
#0206: "Vol. 2, No. 6"
#0301: "Vol. 3, No. 1"
#0302: "Vol. 3, No. 2"
#0303: "Vol. 3, No. 3"
#0304: "Vol. 3, No. 4"
#0305: "Vol. 3, No. 5"
#0306: "Vol. 3, No. 6"
#0401: "Vol. 4, No. 1"
#0402: "Vol. 4, No. 2"